Julian Rhee, age 15, is from Brookfield, Wisconsin and has numerous awards. Among his accomplishments are the first place winner and grand-prize winner of the 2015 Milwaukee Symphony Orchestra Young Artist Competition and Audrey G. Baird Scholarship recipient where he was the featured soloist with the MSO; first place winner of the 2015 Madison Symphony Orchestra Bolz Young Artist Competition the Final Forte where he performed a solo with the symphony and was broadcasted live by Wisconsin Public Television and Radio; first place winner of the 2015 Wisconsin Chamber Orchestra Young Artist Competition; first place winner of the 2015 Milwaukee Youth Symphony Orchestra Senior Symphony Concerto Competition; first place winner of the 2015 Concord Chamber Orchestra Young Artist Competition; first place winner of the 2015 Society of American Musician Competition (SAM) both in the Senior and junior Division; first place winner of the junior String Division and Overall Junior Division of the 2013 Walgreens National Concerto Competition; first place winner of the Junior and Senior Divisions of the Sejong Music Competition sponsored by Korea Times of Chicago; first place winner of the MYSO Sinfonia and Philharmonia Concerto Competition at age 10 and 11; and winner of the Bach Double Competition and performed side by side with the Milwaukee Symphony Orchestra at age 7. 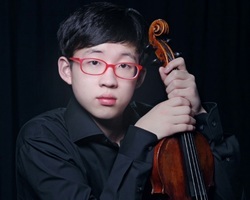 At age 12, he was the youngest semifinalist to advance and compete at the 2013 Stradivarius International Violin Competition and the youngest fellowship recipient of the Montecito International Music Festival. Julian was the featured soloist at the opening concert for the 2015 Piano Arts Music Festival and Competition; 2015 Concert on the Green; 2016 Young Steinway Concert Series and recently, he was the guest soloist with the Chippewa Symphony Orchestra, Fox Valley Orchestra and Pittsburgh Symphony Orchestra in their 2016-2017 season. Julian was also one of the semifinalists to advance to compete at the prestigious 2015 Johansen International Competition; 2015 Cooper International Competition and the youngest competitor and semifinalist of the 2016 William C. Byrd National Competition. Recently, Julian was the first place national winner of the 2016 Music Teachers National Association (MTNA) Senior Strings Competition. Julian is a concertmaster of the MYSO Senior Symphony Orchestra and attends Brookfield East High School. He is a merit scholarship recipient and studies privately with Ms. Hye-Sun Lee at the Music Institute of Chicago.